This week I focused most of my time working with client’s Google+ accounts as its one social networking platform which I don’t feel like I have focused much on since I have been working with Photolink and is within my personal job role as Social Butterfly. 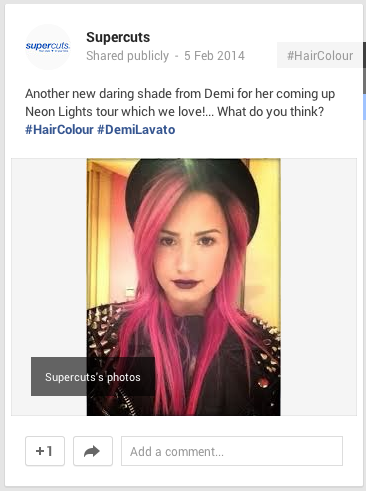 Here is one of my posts for Supercut’s (I’m also personally loving Demi’s new daring colour, I want it! ), as well as posting material, I also spent time interacting with other users commenting, sharing and reposting, slowly but surely I’m starting to master the network! A new task for the week was to find some of the main competitors for Photolink, mainly their studios to help improve their Twitter presence. This was really interesting looking into all the local competition and something new and fun to research into.